The Casoni della Saccisica (thatched country houses, southeast of Padua) are the old dwellings where the farmers once lived. They were made with clay and stone and had straw and reeds roofs. In the mid-twentieth century, given the lack of healthiness (there was no pavement but just tamped earth floor, the walls were not plastered, the barn was inside the house close to the kitchen) many of these houses were demolished to build modern houses, with an incentive by the municipality. In the Saccisica area only two owners refused to take down their mansions (the Casone Ramei was inhabited until 1979, the Casone Rosso until 1990). Thanks to their decision, we can still admire and visit these two beautiful lodges. I admit: before starting the blog I had never heard of the Casoni della Saccisica. With the blog I started to inquire more about the monuments, landmarks and all that my area has to offer and I discovered the existence of these casoni. To get here, beware of the Gps navigation device and of Google Maps: we used Google Maps with our Smartphone to find via Ramei (where Casone Ramei is) and it took us to the other end of the street, which is closed to traffic so we had to go all the way around to get there. Instead, following the main road you arrive in a bit. Upon arrival to Casone Ramei we were greeted by Michele, a volunteer of the Casoni di Piove di Sacco group. Very passionate and funny, he told us in every detail how was life in this house (consisting of kitchen, barn, workshop, bedroom, a room for the work with the chassis) and explained the use of many of the objects (antiques). For example we saw the flies trap, a kind of open glass flask under which the owners put something sugary so that the insects remained trapped, the warming pan for the bed, an old wooden walker, the old child seat for the bike, the old games for children, tools for woodworking, yokes and muzzles for animals and many other interesting items. I had already seen many of them in antique markets or historical films, others… I had never seen them before. It was very interesting. It must be interesting even for kids to visit this casone. Michele said in fact that often schoolchildren come to visit the and they know nothing of this rural culture. Many mistake the walker for a toilet, for example. 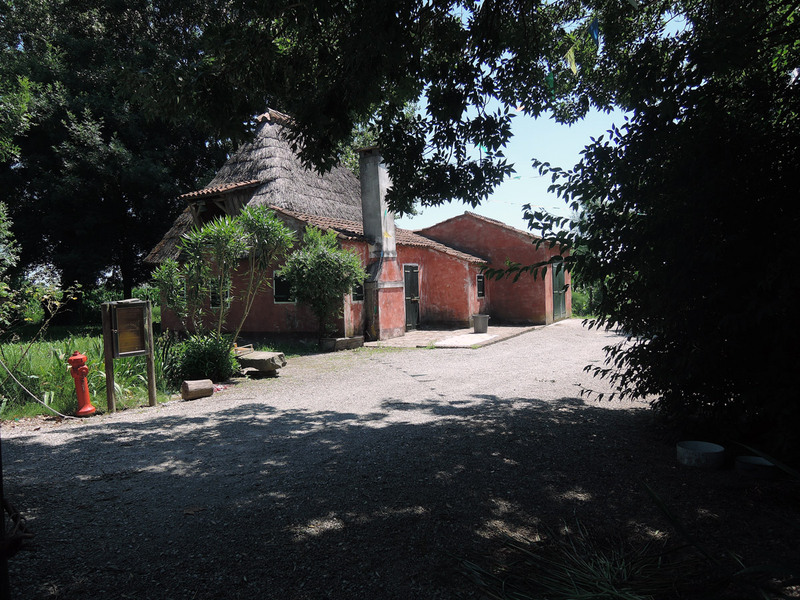 He also explained that these Casoni della Saccisica are unique because they were used as dwellings unlike other lodges in other areas that were used mainly as a retreat for hunting or fishing. Next to the big house there is another little house, which was the cellar. Inside there are the tools to produce the wine. Behind it there is the toilet (passable). All around there is a large park (10,000 square meters) with space for picnics and parties (by reservation). Resting at the park is free and open to anyone (during the opening hours of the casone). Not far away (the road is closed to traffic, you can get there on foot or by bike parking in Corte, the closest village) is the Casone Rosso, that can only be visited on request. We saw it only from outside. It was very cute with that brilliant colour, surrounded by a garden with chickens and goats.